St. Michael's Monastery in Kiev. Ukrainian nationalism refers to the Ukrainian version of nationalism. Although the current Ukrainian state emerged fairly recently, some historians, such as Mykhailo Hrushevskyi, Orest Subtelny and Paul Magosci, have cited the medieval state of Kievan Rus' as an early precedent of specifically Ukrainian statehood. The origins of modern Ukrainian nationalism have also been traced to the 17th-century Ruthenian uprising against the Polish–Lithuanian Commonwealth, led by Bohdan Khmelnytskyi. The Cossacks played a role in re-awakening a Ukrainian sense of identity within the steppe region. A dominant figure within the Cossack movement and in Ukrainian nationalist history, Bohdan Khmelnytsky (c. 1595 – 1657), commanded the Zaporozhian Cossacks and led the Khmelnytsky Uprising against Polish rule in the mid-17th century. Khmelnytsky also succeeded in legitimizing a form of democracy which had been practiced by cossacks since the 15th century. This sense of democracy played a key part of the sense of ethnic identity. Bohdan Khmelnytsky spoke of the liberation of the "entire Ruthenian people" and recent research has confirmed that the concept of a Ruthenian nation as a religious and cultural community had existed before his revolution. Modern Ukrainians still remember and glorify Khmelnytsky's role in the history of Ukraine. Another prominent figure in Cossack nationalism, Hetman Ivan Mazepa (1639-1709), made large financial contributions focused on the restoration of Ukrainian culture and history during the early 18th century. He financed major reconstructions of the Saint Sophia Cathedral in Kiev, and the elevation the Kyiv Mohyla Collegium to the status of Kyiv Mohyla Academy in 1694. Politically, however, Mazepa was misunderstood and misrepresented, and found little support among the peasantry. One of the most prominent figures in Ukrainian national history, the Ukrainian poet Taras Shevchenko, voiced ideas of an independent and sovereign Ukraine in the 19th century. Taras Shevchenko used poetry to inspire cultural revival to the Ukrainian people and to strive to overthrow injustice. Shevchenko died in Saint Petersburg on March 10, 1861, the day after his 47th birthday. Ukrainians - not only the citizens of Ukraine, but Ukrainians who live throughout the world - regard him as a national hero. His collection of poetry Kobzar was the second book almost in each Ukrainian household in the beginning of 20th century (after the Bible). He became a symbol of the national cultural revival of Ukraine. Beside Shevchenko numerous other poets have written in Ukrainian. Among them, Volodymyr Sosyura in his poem Love Ukraine (1944) stated that one cannot respect other nations without respect for one's own. Postcard published by the Ukrainian Brigade, “United Ukrainians fighting both Polish and Russian forces”, 1920. With the collapse of the Russian Empire a political entity which encompassed political, community, cultural, and professional organizations was established in Kiev from the initiative from the Association of the Ukrainian Progressionists (abbr. TUP). This entity was called the "Tsentralna Rada" (Central Council) and was headed by the historian, Mykhailo Hrushevskyi. On January 22, 1918, the Tsentralna Rada declared Ukraine an independent country. This independence was recognized by the Russian government headed by Lenin, as well as the Central Powers and other states. However, this government did not survive very long because of pressures not only from Denikin's Russian White Guard, but also the Red Army, German and Entente intervention, and local anarchists such as Nestor Makhno and (Green Army of Otaman Zeleny). As Bolshevik rule took hold in Ukraine, the early Soviet government had its own reasons to encourage the national movements of the former Russian Empire. Until the early-1930s, Ukrainian culture enjoyed a widespread revival due to Bolshevik concessions known as the policy of Korenization ("indigenization"). In these years an impressive Ukrainization program was implemented throughout the republic. 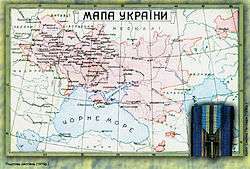 In such conditions, the Ukrainian national idea initially continued to develop and even spread to a large territory with traditionally mixed population in the east and south that became part of the Ukrainian Soviet Socialist Republic. At the same time, despite the ongoing Soviet-wide anti-religious campaign, the Ukrainian national Orthodox Church was created, the Ukrainian Autocephalous Orthodox Church. The church was initially seen by the Bolshevik government as a tool in their goal to suppress the Russian Orthodox Church, always viewed with great suspicion by the regime for its being the cornerstone of the defunct Russian Empire and the initially strong opposition it took towards the regime change. Therefore, the government tolerated the new Ukrainian national church for some time and the UAOC gained a wide following among the Ukrainian peasantry. These events greatly raised the national consciousness among the Ukrainians and brought about the development of a new generation of Ukrainian cultural and political elite. This in turn raised the concerns of Joseph Stalin, who saw danger in the Ukrainians' loyalty towards their nation competing with their loyalty to the Soviet State and in early 1930s the "Ukrainian bourgeois nationalism" was declared to be the primary problem in Ukraine. The Ukrainization policies were abruptly and bloodily reversed, most of the Ukrainian cultural and political elite was arrested and executed, and the nation was decimated with the famine called the Holodomor. After World War I, lands of what is today Western Ukraine were incorporated into newly restored Poland. Tadeusz Hołówko died in Truskawiec (Truskavets) on August 29, 1931, one of the first victims of an assassination campaign carried out by militants of the Organization of Ukrainian Nationalists (OUN). On 15 June 1934, Bronisław Pieracki was assassinated by a Ukrainian nationalist from the Organization of Ukrainian Nationalists. With the outbreak of war between Nazi Germany and the Soviet Union in 1941, many nationalists in Ukraine thought that they would have an opportunity to create an independent country once again. An entire Ukrainian volunteer division of the SS had been created. Many of the fighters who had originally looked to the Nazis as liberators, quickly became disillusioned and formed the Ukrainian Insurgent Army (UPA) (Ukrainian: Українська Повстанська Армія - У.П.А. ), which waged military campaign against Germans and later Soviet forces. The primary goal of OUN was “the rebirth, of setting everything in order, the defense and the expansion of the Independent Council of Ukrainian National State”. OUN also revived the sentiment that “Ukraine is for Ukrainians”. 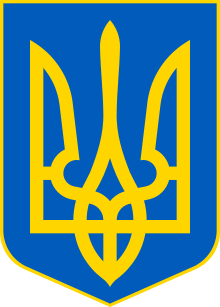 On June 30, 1941, the OUN, led by Stepan Bandera, declared an independent Ukrainian state. This was immediately acted upon by the Nazi army, and Bandera was arrested and imprisoned from 1941 to 1944. Ukrainian nationalists demonstrate against Soviet Union and for a free Ukraine in 1941. The UPA was a military group that took up arms first against the Nazis and later against the Soviets. During World War II, the UPA fought against the Polish, German and Soviet forces. After the Second World War, UPA took actions directed against Soviet rule within Ukraine. Many members of the UPA saw themselves as the armed wing of the OUN in its struggle for Ukrainian independence. There has been much debate as to the legitimacy of UPA as a political group. UPA maintains a prominent and symbolic role in Ukrainian history and the quest for Ukrainian independence. At the same time it was deemed an insurgent or terrorist group by Soviet historiography. Ukrainian Canadian historian Serhiy Yekelchyk writes that during 1943 and 1944 an estimated 35,000 Polish civilians and an unknown number of Ukrainian civilians in the Volhynia and Chelm regions fell victim to mutual ethnic cleansing by the UPA and Polish insurgents. Niall Ferguson writes that around 80,000 Poles were murdered then by Ukrainian nationalists. Norman Davies in his book Europe at War 1939–1945: No Simple Victory puts the number of murdered Polish civilians at between 200,000 and 500,000, while Timothy Snyder writes that Ukrainian nationalists killed "between forty to sixty thousand Polish civilians in Volhynia in 1943". The most celebrated event in modern Ukrainian nationalist history is the achievement of independence from the Soviet Union after its collapse in 1991. 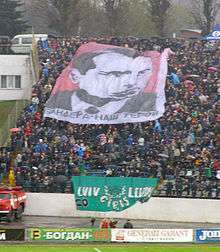 Lviv football fans at a game vs. Donetsk. The banner reads "Bandera - our hero"
Voters from Western Ukraine and Central Ukraine tend to vote for pro-Western and pro-European general liberal national democrats with the Our Ukraine Blocs and Bloc Yulia Tymoshenko (now Batkivshchyna) as its frontrunners; UDAR replaced the Our Ukraine Bloc in the 2012 Ukrainian parliamentary election. Our Ukraine, a major national democratic force in Ukrainian politics in the early 21st century met with total failure since the 2010 Ukrainian local elections. While in Eastern Ukraine and Southern Ukraine pro-Russian parties get the vote. Since the 2012 Ukrainian parliamentary election Fatherland and UDAR cooperate officially with All-Ukrainian Union "Svoboda". Until the 2009 Ternopil Oblast local election Svoboda and other nationalist parties role in Ukrainian politics had been extremely marginal. However, in the 2012 parliamentary elections Svoboda came in fourth with 10,44% (almost a fourteenfold of its votes compared with the 2007 parliamentary elections) of the national votes and 38 out of 450 seats. From the 1998 parliamentary elections[a 1] till the 2012 parliamentary elections no nationalist party obtained seats in the Verkhovna Rada (Ukraine's parliament). In these elections nationalist right wing parties obtained less than 1% of the votes; in the 1998 elections they obtained 3.26%. The nationalist party Svoboda had an electoral breakthrough with the 2009 Ternopil Oblast local election when they obtained 34.69% of the votes and 50 seats out of 120 in the Ternopil Oblast Council. This was the best result for a far-right party in Ukraine’s history. In the previous 2006 Ternopil Oblast local election the party had obtained 4.2% of the votes and 4 seats. In the simultaneously held local elections for the Lviv Oblast Council it had obtained 5.62% of the votes and 10 seats and 6.69% of the votes and 9 seats in the Lviv city council. In the 2010 Ukrainian local elections Svoboda achieved notable success in Eastern Galicia. In the 2012 parliamentary elections Svoboda came in fourth with 10,44% (almost a fourteenfold of its votes compared with the 2007 parliamentary elections) of the national votes and 38 out of 450 seats. Since the 2012 Ukrainian parliamentary election Batkivshchyna and UDAR cooperate officially with Svoboda. Ukrainian bourgeois nationalism is the ideology and politics of the Ukrainian bourgeoisie. Exploiting society, the social base of Ukrainian bourgeois nationalism was a stratum made up of all urban and rural bourgeoisie starting from the big capitalists, owners of big industrial enterprise, and finishing with numerous layers of the bourgeois class under capitalism, kurkul. The economical base for the growth of Ukrainian bourgeois nationalism in the epoch of imperialism is the same as for that of any nationality, that is, the increase of imperialist competition for sales markets and raw materials. Ukrainian bourgeois nationalism was a cliché of Soviet phraseology such as "Proletarian internationalism", "Fraternity of peoples", "Agitprop", "Stakhanovite movement", "Enemy of the people" and numerous others. According to Soviet ideology Ukrainian bourgeois nationalism was a specific form of bourgeois nationalism recognizing the superiority of national interests over class interests (see Class in Marxist theory). The idea of bourgeois nationalism was required to keep consistency with the Bolshevik's Declaration of the Rights of the Peoples of Russia which set a wave of secession movements across the former Russian Empire. This concept of nationalism was also used to identify everyone who did not share the national policy principles of the Communist Party (Bolsheviks), proletarian internationalism, and did not fit under the definition of bourgeois cosmopolitanism. In Soviet ideology, bourgeois cosmopolitanism was a negative phenomenon and opposite to the proclaimed fraternity of peoples. The term first appeared in the 1920s in the documents of the Communist Party and spread into Soviet journalism and science literature. It was needed as an ideological device. Similarly, Soviet historiography equated Ukrainian nationalism with fascism and with nazism despite the fact that racism and cult of personality were extrinsic to Ukrainian nationalism, which was its distinction. ↑ In the 1998 parliamentary elections the radical nationalist bloc of parties (Social-National Party of Ukraine and "State Independence of Ukraine") called "Less Words" (Ukrainian: Менше слів) collected 0.16% of the national vote but from the bloc (only) Oleh Tyahnybok was voted into Parliament. ↑ Wilson, Andrew. Ukrainian Nationalism in the 1990s: A Minority Faith. Cambridge University Press. London: 1997. 6. ↑ "Ministry for Foreign Affairs of Ukraine - Publications". Mfa.gov.ua. Archived from the original on 2010-12-29. Retrieved 2010-04-18. 1 2 "Mazepa, Ivan". Encyclopediaofukraine.com. Retrieved 2010-04-18. 1 2 Kleiner, Israel. From Nationalism to Universalism Vladmir (Ze’ev) Jabotinsky and the Ukrainian Question. Canadian Institute of Ukrainian Studies. Edmonton: 2000. 66. 1 2 3 Ukraine. MSN Encarta. Archived from the original on 10 December 2006. ↑ "Treaty of Brest-Litovsk". The Columbia Encyclopedia, 6th ed. 2016. Retrieved 1 April 2016. ↑ Wilson, Andrew. Ukrainian Nationalism in the 1990s: A Minority Faith. Cambridge University Press. London: 1997.47-51. ↑ Wilson, Andrew. Ukrainian Nationalism in the 1990s: A Minority Faith. Cambridge University Press. London: 1997. 48. 1 2 "Bandera, Stepan". Encyclopediaofukraine.com. Retrieved 2010-04-18. ↑ "The UPA - Ukrainian Insurgent Army - - www.upa.com.ua". Tern.ukrpack.net. Archived from the original on 2008-05-27. Retrieved 2010-04-18. 1 2 Wilson, Andrew. Ukrainian Nationalism in the 1990s: A Minority Faith. Cambridge University Press. London: 1997. 51. ↑ The Reconstruction of Nations By Timothy Snyder, page 170. Books.google.com. 2006-03-22. ISBN 978-0-300-10586-5. Retrieved 2010-04-18. Oleksandr Palchenko. Ukrainian nation and Ukrainian people. First Social Agreement. Bourgeois nationalism. Ukrainian Tyzhden. Fall 2011.